Nutrismile Ester C Toothpaste is a nutrient-rich, daily defense to keep your teeth and gums healthy. High potency Ester C helps reinforce tooth enamel and defend against tooth decay. Three natural whiteners polish and whiten without harsh abrasives. Natural anti-bacterial Perilia Seed Extract helps block the formation of sugar acids and micro organisms that form tartar on teeth. Calcium Carbonate, Aqua (Purified Water), Vegetable Glycerin, Sodium Cocoyl Glutamate, Carrageenan, Ascorbic Acid (Vit.C), Aloe Barbadensis (Aloe Vera/Aloes) Leaf Gel*, Bambusa Arundinacea (Bamboo) Stem Extract, Perilla Ocymoides (Perilla) Seed Extract, Mentha Piperita (Peppermint/Menthe Poivree) Oil, Cinnamomum Zeylanicum (Cinnamon) Bark Oil, Citrus Aurantium Dulcis (Orange) Oil, Ester-C Calcium Ascorbate, Sodium Bicarbonate, Silica, Menthol, Stevioside, Citrus Grandis (Grapefruit) Seed Extract. Children Under 6 Months: Use a pea sized amount. I changed to this toothpaste after struggling to fit nd a fluoride free toothpaste without a sugar substitute in it. 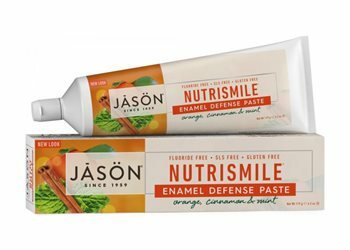 This toothpaste is one of the few fluoride free with no sugar substitute. I hadn't realised it wasn't just mint flavour; however don't let that put you off as the flavour is easily palatable & mild. It leaves teeth feeling clean & breath fresh.